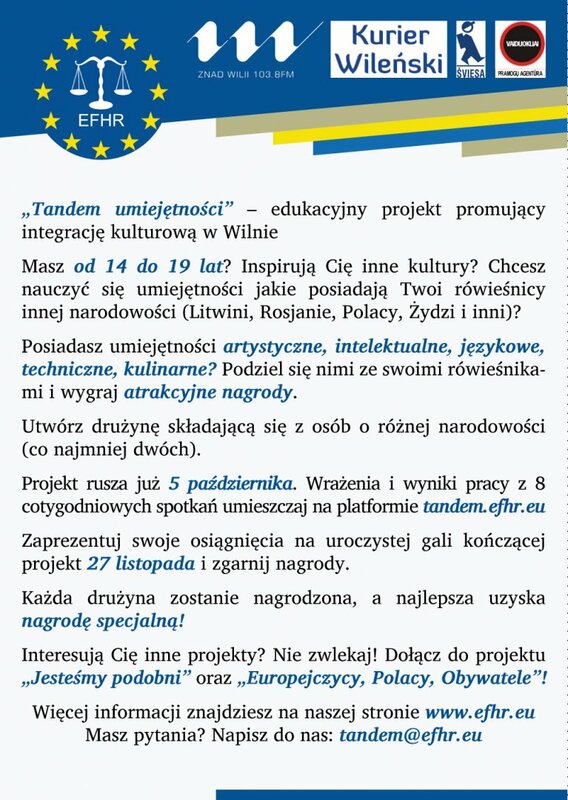 The European Foundation of Human Rights (EFHR) informs that the educational project “Skills Tandem“, which have started on October the 5th, promoting the cultural integration in Vilnius, is already at the halfway point. 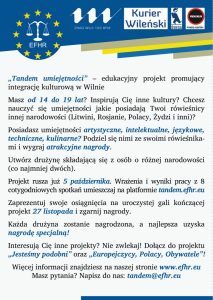 The main task of the project is the social integration of young people of different nationalities – Lithuanians, Poles, Russians, Belarusians, Jews, Karaites, and others, by using the educational method of “tandem”. It is worth mentioning that students from various schools of Vilnius, the Vilnius region and the Šalčininkai District participate actively in the project. For example, from the Adam Mickiewicz junior high school, the Polish-Lithuanian junior high school of St. Rafał Kalinowski in Nemėžis, the high school in Zujūnų, and the Alexander Pushkin high school. The students from different schools are sharing their artistic, linguistic, technical and other skills. During the 8 meetings the members of the teams presented i.a. the history of Lithuania and Poland, studied the basics of Polish and learned about the religion of Islam in the town in which they live. The participants of the projects are representatives of nationalities such as Polish, Lithuanian and Russian. Coverage of the meetings can be found on the website tandem.efhr.eu. The gained skills will be presented by the participants on a celebratory gala which will close the project on 27th November at 5:30 PM in hotel Runmis at 103 Liepkalnio Street in Vilnius. We would like to invite all of the members to come together with their families and friends. All of the participants of the projects will receive rewards and certificates. We will also prepare a sweet treat for the guests. All are welcomed to come and enjoy!